The Nyx is the Gallente Supercarrier. 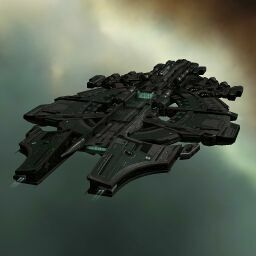 With a damage bonus to fighters and fighter-bombers that no other supercarrier has, the Nyx is immensely popular among null-sec and low-sec alliances. This makes it a common sight in null-sec supercapital fleets. Further information about additional or recommended skills to pilot Nyx for a specific or it's common role(s) can be written here. Slightly less tank than the Aeon but has more utility. 27.8M EHP with High Grade Slaves and HG-1008 implant. 35.3M EHP with maximum strength Command Ship links. Not a full blown Ratting super. Use a Hel instead. Mind the capacitor when using the Afterburner (cycle it once to align). Always stay above jump cap levels (71.25% with Jump Drive Operation V). No sub-article about Nyx roles or piloting tactics. You can write them here. In Greek mythology, Nyx was the goddess of night, consort of Erebus, and mother of Thanatos, Moros, and Nemesis, among others. This page was last modified on 16 April 2018, at 11:40. This page has been accessed 113,542 times.